My Dead Neighbor's Property is Overgrown. What Can We Do? Home » The Law & You » My Neighbor Has Died and His Property is Overgrown. What Can We Do? My Neighbor Has Died and His Property is Overgrown. What Can We Do? A viewer says his dead neighbor’s property has not been looked after. With dead trees in danger of falling into his property, is there anything he can do? 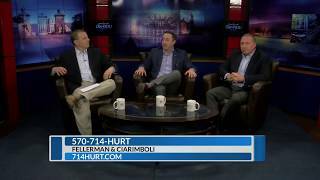 Fellerman & Ciarimboli attorneys Greg Fellerman and Ed Ciarimboli discuss his options. Dave Kuharchik: It’s a neighbor’s property that’s simply not being maintained, We’ll talk about how to handle that situation in “The Law & You” Here are attorneys Greg Fellerman and Ed Ciarimboli. Guys good to see you today. Ed Ciarimboli: Dave, you’ve been working out? You look fantastic. Dave: Well, it’s amazing Ed, you and I have ended up in the same fitness class at the YMCA. Ed: I know, I know. I’m telling you, I love it. Dave: You tear it up. He’s impressive. Ed: Neither one of us are as impressive as [Greg]. He’s an hedonist over here. Dave: Well, I was just going to say. Greg Fellerman: Nah, I’ve got a lot of work to do. Ed: Kevin, this is a really interesting situation. It’s an interesting question, probably something that’s happens more often than you hear about. In order to actually litigate this, you’re going to need to open an estate for the individual that passed away so you can actually have litigation against the estate. The litigation is going to essentially be forcing them to maintain or take care of the property. That’s really the only answer I can think of. Greg: Or there could be an estate open, and I think the other thing you can do is you might be able to reach out to the city, the town you live in. The cities don’t want run down properties, they want to maintain in compliance with their laws. That would be another step I think you could do. The problem may be who could enforce it if there’s no estate and the property’s just kind of going by the way side. It’s a little more complicated than just “Hey, what do you do,” but I would put a call into the city, too and see what you could do to get some help. Ed: Yeah, definitely start with the city. This is not the type of work we do, but we certainly have some great partners that handle estates and trusts and real estate work that we can get you to. It’s going to be a complicated process, but certainly something you’re going to have to get a handle on quickly. Dave: Give the guys a call, check them out online and maybe even get a fitness tip. Results matter with attorneys Greg Fellerman and Ed Ciarimboli. See you next time, guys.